Latest model garage storage shelving - offers 2.0m of storage space - perfect for fishing rods, garden tools and more! Universally expandable - purchase multiple and span the entire length of your garage - joins in seconds! Latest model garage storage shelving - offers 1.5m of storage space - perfect for fishing rods, garden tools and more! Aussie garages are not just for storing vehicles, they are storage hubs for many items which can turn your garage into a disorganised mess. 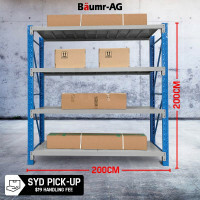 Baumr-AG and Shelf-Tek Garage Storage Solutions & Warehousing can help organise your space without hurting your wallet. 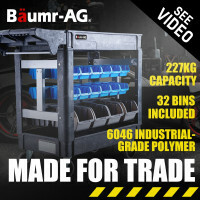 Baumr-AG & Shelf-Tek Garage & Warehouse Storage Solutions provide flexible space for various items from bikes & golf clubs to heavy machinery, auto spares, air compressors, stationary engines & more. 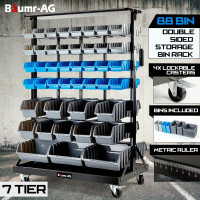 Designed to look great in any garage or warehouse, storage shelfs, racks, cabinets & storage bins are very easy to assemble, no bolts or screws needed, only a mallet to simply tap things into place. Sealed shelving makes for easy cleaning & the black powder coating is used for rust resistance. 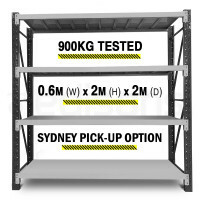 Other features include the adjustable shelving, cabinets, industrial strength steel & height-adjustable pull-out drawer. 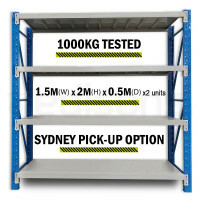 Ideal for those in search of something more efficient and economical, all garage shelving has a complete ultra-durable frame, all Bin Racks come in various bin sizes and slots for the labelling of parts. 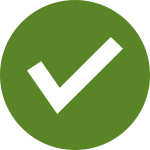 Whether you’re in a garage or at a workshop or warehouse, you can minimize the handling of parts, lessen assembly times, reduce and control inventories and boost production efficiency. 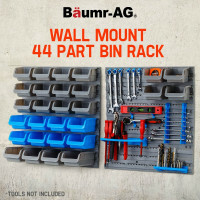 Other included features are our ultra-durable wall mounted peg board option with full-length deep drawers, tool holders and interlocking pins for added support & removal of shelf panels. The work benches include features like the interchangeable platforms, impervious steel shelf and the extra-long work space. Edisons also offers other durable and affordable storage solutions like Tool Cabinets & Chests, Workbenches and Bin Racks. Experience organized and clutter-free surroundings today nad purchase one of our many storage solutions options.